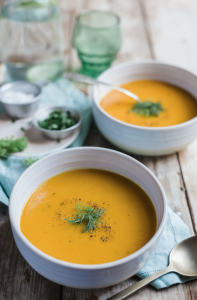 On the days you feel under the weather – the changing seasons tend to have that affect – your tummy loves nothing more than a truly tasty, heartwarming bowl of soup. We are partial to this tried-and-tested roast carrot and fennel flavour that contains three sachets of our delicious bone broth – and is so easy to prepare. Put the carrots, fennel and onion in a roasting dish and toss with 2 tablespoons of olive oil. Roast for 20 minutes, then add the garlic cloves. Stir everything thoroughly and return to the oven for 20 minutes more, until the vegetables are soft and browned. Remove the papery skins from the garlic cloves. Put the roasted veg in a large pan with the vegetable stock and bring to the boil. Simmer gently for 15 minutes, then liquidise with a stick blender, until completely smooth.